Burn assessment can be challenging, even for those who do it often. This page includes some useful tips from burn care experts regarding aspects of burn assessment, and some advice to help avoid common pitfalls. It’s ok to ask for help. It’s expected. Assessing burns accurately is fundamental to quality burn care as it informs the subsequent management of the injury. This includes an accurate burn depth assessment as this will determine if the wound can heal on its own, or whether it requires a surgical referral & intervention. Similarly, assessing %TBSA burns accurately, or at least within 5% of the actual %TBSA, will avoid a cascade affecting fluid resuscitation and possible over or under triage. If you are in any way unsure, it’s ok to ask colleagues to double check your burn assessment, it helps refine both of your skills. This a common practice within the Burn Service to develop skills & expertise. In particular, the low incidence of severe burns in Australia means that clinicians outside a Burn Service have limited opportunities to develop skills and experience. It’s expected to ask questions about it. Depending on the urgency of the case, Adult Retrieval Victoria can also provide remote clinical support, especially for cases which meet Major Trauma Transfer criteria. The state’s two Burn Services can also provide support for non-time critical cases. Telehealth facilities, or at a minimum, a digital camera and a mobile network, can provide immediate expert help. Refer to the Transfer & Referral Tab for contact details. Refer to the Burn Assessment Tab for more information on %TBSA Burn Assessment. Refer to the Burn Assessment Tips & Pitfalls Tab for tips and advice on burn wound assessment, and find out more about ANZBA’s EMSB Course to improve your burn assessment & management skills. Do not include erythema in the overall %TBSA burn assessment. 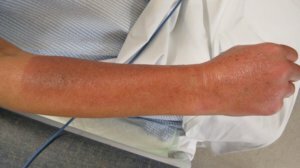 Erythema should not be included in the overall %TBSA burn assessment. Erythema is areas of epidermal burn that look like a gentle sunburn. It is important to exclude erythema in the %TBSA calculation to avoid an inaccurate assessment, this could lead to over resuscitation and over treatment. Superficial burns are uncommon in older people. The dermis becomes thinner as people age, the same burn in a young person, is likely to be deeper in an older person. Older people are more likely to have co-morbidities which can complicate and delay wound healing such as diabetes, vascular disease, immune conditions etc. The burn injury can be a symptom of broader health concerns relating to frailty and safety and needs to properly assessed. Burns in older people meet the ANZBA Referral Criteria due to these complexities. If a minor burn in an older person is managed outside of a the Victorian Adult Burn Service we recommend frequent reassessment of the wound particularly in the first 3 days following injury. This will determine if the originally superficial dermal converts to a deeper burn as this will change wound management goals. A detailed history of the mechanism of injury can help identify any safety concerns which should be appropriately addressed and referred on if necessary, and comorbidities should be optimised to promote wound healing. Do not assume a red burn wound appearance means the burn is superficial. Epidermal burns involve the epidermal layer of the skin which remains intact but damaged over underlying undamaged dermis. At times, in deeper burns involving the dermis, the destroyed overlying epidermis still covers the burn wound, which can disguise the burn as an epidermal burn. To minimise the likelihood of misdiagnosis or incorrect assessment, it is important to determine if the epidermis is attached. Using a gloved finger, place a fingertip on the area of possible epidermal burn and rotate or wipe the finger across the surface using gentle pressure. In a healthy epidermis, it will move with the underlying skin structures. If the epidermis moves with your finger, its damaged and detached and the burn is likely to be at least superficial in depth. If this occurs, continue to assess all ares of epidermal burn for an intact epidermis, and areas that are not intact should be included in the overall % TBSA assessment.